The greatest instrument of all time, guitar is fairly portable, relatively inexpensive, easy enough to learn the basics – without any age limit – and you can take your playing as far as you want. 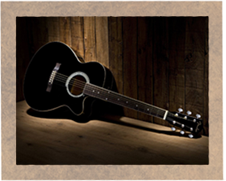 Eastern Fare provides classes in acoustic, classical and bass guitar. We can teach different types of guitars "acoustic and electric "
Our guitar teacher, Syed Nozrul, is a rock star who has his own production house and has given out many beautiful and melodious songs. He has graced us with his presence and obliged us by joining our group. Our students enjoy his classes thoroughly. Indeed a very dedicated teacher and a sufi soul. His music can be experienced at his Youtube channel : DM Productions. Welcome to the Anu Music Academy Online Guitar Classes. So if you are looking for beginner guitar lessons, rhythm guitar lessons, lead guitar lessons, or blues guitar lessons. With detailed understanding in this realm, we are involved in presenting Guitars Training Service. These services are imparted by some of the most assiduous and experienced executives as per set industry norms and guidelines. As well, their flexibility, reliability and cost effectiveness make these a preferential market choice. 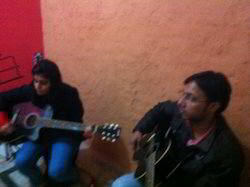 Best guitar classes in gurgaon along with vocals with free of cost. Must come for trial classes.